SeyCCAT’s goal is to competitively grant at least US$ 750,000 per annum to support the stewardship of Seychelles’ ocean resources, island life and blue economy. We believe that SeyCCAT’s funds provide a solid foundation for creative collaborations and that together we can secure Seychelles’ Blue Future. 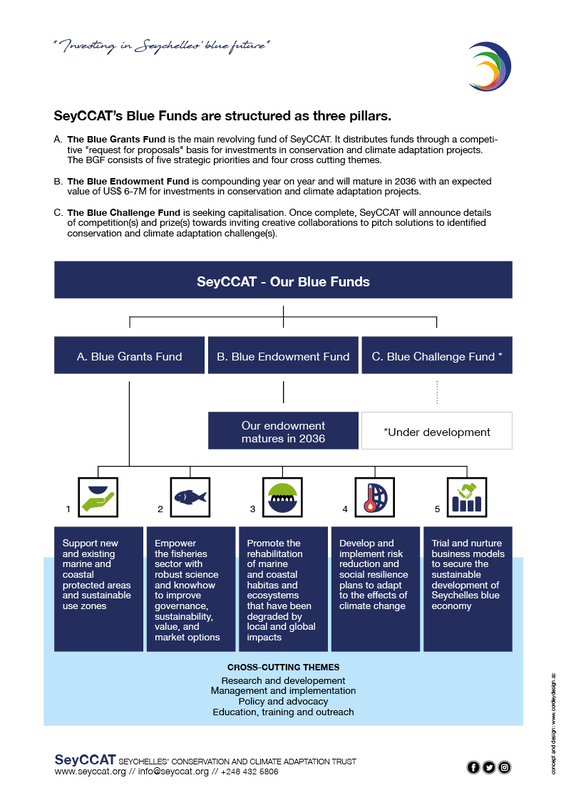 SeyCCAT’s current cash flows capitalise our Blue Grants Fund (BGF) and our Blue Endowment Fund (BEF). The BEF is due to mature in 20 years time with an expected ending value of US$6-7M. We are also exploring options to capitalise a Blue Challenge / Enterprise Fund. The BGF is our active revolving fund and from where current projects are funded. Access to these funds is through a competitive Request for Proposals (RFP) process. Small-medium grants up to SCR 100,000. These grants will be awarded on the basis of an approved concept note. The maximum duration of grant awards is 12 months for a small-medium grant. Large grants between SCR 100,000 and SCR 1,000,000. These grants will be short-listed on the basis of the concept note (stage 1), and then awarded on the basis of a full proposal (stage 2). The maximum duration of grant awards is 24 months for a large grant. We have designed our application process to be as straightforward as possible. We have adopted international best practices to ensure that we select projects through a competitive and transparent process. Each BGF Request for Proposals focuses on one or more of our five strategic objectives. In addition, we seek projects that demonstrate alignment with one or more of the four cross cutting themes (click below). Trial and nurture appropriate business models to secure the sustainable development of Seychelles’ blue economy. We are committed to supporting projects that align with national and international priorities, such as those articulated in the National Biodiversity Strategy and Action Plan (NBSAP), the Sustainable Development Goals (SDG’s) and targets, the Convention on International Trade in Endangered Species of Wild Fauna and Flora (CITES), and the Convention on Biological Diversity (CBD) Aichi targets. We are dedicated to supporting partners and projects that demonstrate robust monitoring, evaluation and learning so that we can validate evidence of project impacts and outcomes. We challenge our partners to be able to demonstrate the social and environmental returns of our investments. Where relevant, we are keen to explore projects that adopt technology and advance circular, non-linear, regenerative principles. The RFPs are each unique, designed to build on the learning from previous projects supported by SeyCCAT and others. Our approach is emergent, and we are committed to a nimble project investment strategy to ensure we are supporting the forefront of national conservation priorities. 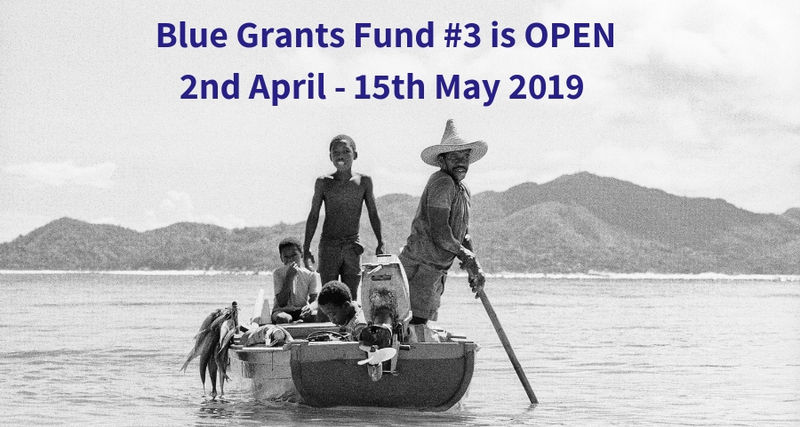 The third SeyCCAT Blue Grants Fund (BGF#3) is now OPEN from 2nd April 2019 to 15th May 2019. We are supporting specific types of projects under all five of our strategic objectives. Below you will find more information about the types of projects we are able to support this year. Contribute research for the design of marine protected area management plans. Contribute to implementation of existing or proposed management plans, e.g., GOS-UNDP-GEF Outer Islands Project. Contribute to development of indicators (biological, ecological, and socioeconomic) for management plans and for evaluating effectiveness of marine protection areas. Contribute to improving the decision-making process for management and harvest strategies for data-poor fisheries. Contribute to improving capacity to protected area agencies and increasing management effectiveness. Develop “best in class” sustainable tourism practices linked to fisheries campaigns and activities such as minimum size limits, daily bag limits, fish procurement policies (seasonality) & sustainably caught seafood on local menus including recommendations for whole fish vs. fillet. Design, deploy & test new tools and technology for participatory monitoring, information sharing and accessing markets (e.g. Apps to document catch and traceability). Foster consumer awareness of sustainable fisheries practices via traditional and social-media channels. Support improvements in the design – and advance the uptake – of Seychelles sustainable seafood label. Rehabilitate nationally important marine and coastal species and ecosystems (e.g., as found in the NBSAP (2014)). Develop knowledge to understand the roles that certain key species play in shaping their environment – keystone species (e.g. herbivore and predation). Implement nature-based solutions to enable ecosystems to maintain or improve their provision of goods and services. Support removal of invasive alien marine and coastal species that threaten native species. Support small businesses, particularly locally owned tourism establishments, to engage with multi-sector initiatives (such as connecting local food production with sustainable consumption). Explore and back science and technology innovations to increase resilience and support adaptation to climate change (to minimise climate impacts on local livelihoods and businesses) including 1) increase understanding; 2) implement appropriate adaptation measures; 3) establish long-term monitoring. Advance Seychelles’ ability to secure access to global climate financing. Study the potential impacts of climate change on critical ecosystems, goods and services (e.g. fisheries productivity), and make recommendations on how negative impacts could be addressed to safeguard sustainability. Improve fisheries post-harvest / value chain performance and market development opportunities. Enhance capacities (training, research and development) for preparing, articulating and executing sustainability-focused business enterprise models (e.g. for submission to the DBS blue investment fund). Support Micro, Small and Medium Enterprises (MSMEs) and small-scale local investors to develop and access opportunities associated with the aquaculture master plan (land-based and inshore business development). Do you have an idea that is in line with the type of projects SeyCCAT can support? 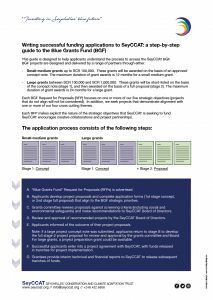 A step-by-step guide to the Blue Grants Fund – how to submit a funding application to SeyCCAT. For BGF#3, we are accepting applications in Creole: SeyCCAT – BGF – Guide – English and Creole. In October, you will be informed whether you have been successful or not! Also ensure you review the following Environmental & Social and Safety guidance as projects must also be compliant with these standards. Your success is our success! We want the world to know what you are doing, you will have to follow the branding guidelines. Unsuccessful – If you have been unsuccessful, you have the option to appeal: Grant application appeal process or you can try again next year! SeyCCAT’s funds aims to be as open and accessible to all Seychellois. The following categories may submit a proposal to SeyCCAT. Proposers must have legally existed and operated in the Seychelles for a minimum of one year. We encourage applications from partnerships and consortia that can demonstrate a shared vision and appreciation of inter-organisational competencies required to achieve a successful project. We actively seek to support “creative collaborations.” Overseas-based organisations are not eligible, although proposals from and led by eligible local organisations may include overseas-based partners. The Board of Directors may decide to restrict the participation of any of the above classes of persons or organisations in any RFP, and this shall be indicated in the scope of each specific RFP. Proposers are required to include details of qualifications and experience to ensure that a sound judgment can be made concerning the proposer’s ability to deliver the project. Proposals must also be compliant with Environmental and Social Safeguards applied by SeyCCAT. Our due diligence policy requires us to screen the legal status of applicants – before applying to SeyCCAT you should check that you are able to satisfy our screening criteria. We aim to undertake a first review of all new concept note applications (small-medium and large grants) within 2-3 months of submission. It could take up to 6 months between the submission of an application and a final decision, so please consider this when submitting an application. Can I submit more than one proposal at the same time? Yes, you can submit more than one proposal as a lead applicant. However, for each specific RFP, we will only consider funding a maximum of one project per organisation. It is possible you could have more than one active SeyCCAT funded project, but they would have been awarded through different RFPs. If you present SeyCCAT with a proposal in collaboration with other organisations, and you are the lead organisation, you are eligible to be a non-lead partner on other submissions for the same RFP. Your guidance says "proposers must have legally existed and operated in the Seychelles for a minimum of one year" - what does this mean? A certified (signed) copy of the minutes of proceedings held at the most recent general meeting. A certified (signed) copy of your police record (this must be a new issue). The option of a certificate of good standing. Please also consult the detailed application guidelines to understand the full application process and requirements. Are there any types of project costs you do not support? A variety of exclusions exist – such as Government administrative or operating costs, large capital purchases, debt servicing – please consult the application guidelines for full details of exclusions. How do you assess or cap project costs (salary, travel, communications, etc)? Costs for all budget line items are examined by the Blue Grants Fund committee and decisions are based on realistic and justifiable budgets to deliver the work plan. At present we do not set upper limits (value or percentage of total budget) for individual budget lines such as salaries, external consultants or equipment. We evaluate projects on a case-by-case basis and we recognise that individual organisations and their proposed projects have unique budget needs and challenges. Final awards may be subject to negotiation with the SeyCCAT Secretariat. What Overhead or Management fee can we charge? Overhead and Management fees may be applied by the proposer but may not be more than more 10% of the total grant. Are projects expected to link to any national or international targets? Yes, we expect projects to be able to articulate how they will contribute to the National Biodiversity Strategy and Action Plan (NBSAP), as well as the international Sustainable Development Goals (SDG’s) and targets, the Convention on International Trade in Endangered Species of Wild Fauna and Flora (CITES), and the Convention on Biological Diversity (CBD) Aichi targets. What should I do if I cannot find my answer here or in the detailed application guidelines? Please send us an email with your enquiry at info@seyccat.org and we will endeavour to respond to you within a few days.